This recipe post really has nothing to do with what I learned in culinary school this week. We continued braising; a technique usually combining dry and moist heat cooking methods (searing food at a high temperature on the stove-top and then adding liquid to come about halfway up the food, covering it with a lid and continuing to simmer on top of the stove or in the oven). We used this method to cook a variety of meats, fish and proteins including veal osso bucco, beef cheeks, red snapper veracruz-style, fennel and endive. It’s a great technique and one that requires a little work in the beginning but not too much maintenance once the food is simmering for a couple of hours. 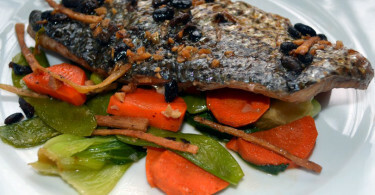 The end results are usually very tender and flavorful. If you are in the mood to braise, just cook these lamb shanks I posted last week. You can also check out some pictures of the food I cook in school by following me on Instagram. I wasn’t in the mood to continue braising when I got home. I was in the mood for eggplant. I had a couple so I sliced one up for breading to use as a topping for thin-sliced chicken with fresh mozzarella and make a parmesan of sorts. I chopped the other one up to make a ragu to serve over rice. The dish wasn’t pre-meditated. My best ones usually aren’t. It’s always nice to play around with ingredients and flavors and then have an end product that tastes great. I took a couple of short cuts, namely using Raos Marinara instead of making a homemade sauce. Oh well. Gotta do what you can to get food on the table for everyone on those crazy busy days. Rao’s is the only pre-made tomato sauce I use. It’s really good and just happens to be gluten-free. Yes! You don’t have to make both dishes but I’ll share both recipes with you. You also can serve the ragu over white rice. I just like to add some Sazón Goya to mine from time to time to switch things up. Line on baking sheet and bake for about 10-15 minutes (until slightly browned edges) on both sides. 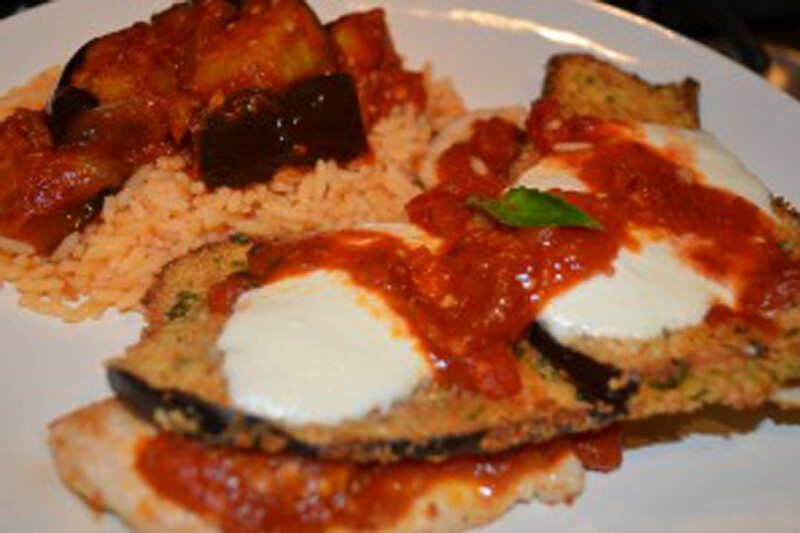 Once eggplant is cooked, place chicken on baking sheet, cover with eggplant and fresh mozzarella and top each piece with a few spoonfuls of heated marinara sauce. Return to oven for a few minutes until cheese is melty and serve. Heat saute pan with olive oil and add eggplant chunks to brown slightly. As they start to soften, add minced garlic and allow to cook for a minute (don't let it burn). Add Rao's Marinara (or any tomato sauce you like). Bring to boil and add fresh or dried herbs, salt, pepper and red pepper flakes to taste. Allow to simmer until eggplant is cooked through and flavors marry (about 20 minutes). *I have listed this recipe as peanut and tree nut-free. Aleias breadcrumbs come with a warning that they are processed in the same facility as peanuts and tree nuts. I believe that is because they produce almond and peanut butter cookies. I called once and was told the equipment was separate for the breadcrumbs and have been using their products in our household with my severely peanut and tree nut allergic children with no issues. However, if you have those allergies, you should contact them to make sure you are comfortable with their practices and any potential cross-contamination issues. Seems tasty and delicious food recipe. Good one and gonna try it once.